The children of year 6 woke up feeling excited at the prospect of what they would be doing for the day. Everyone arrived eager to get going on the journey to London and see which landmarks they could spot. We saw all sorts of buildings which before we had only seen through the TV or computer. The first building we saw was the BT tower which rose high above the other structures. As we moved farther into the city people were spotting things they recognised all the time. The bus finally arrived at our destination, a couple of hundred metres up river from the globe, and got out and enjoyed a leisurely stroll up to the Tate Modern, The Millennium Bridge and the Globe itself. hundreds of gift and souvenirs were for sale. After this we went outside and walked to the Tate Modern where we branched off and started walking over the bridge to where St Pauls Cathedral towered above us. At St Pauls Mrs Harper, who was accompanying the group, told us all about St Pauls and about a monument which stood outside St Pauls dedicated to the Fireman that left their homes to fight the Blitz in London. We then turned round and walk back across the bridge. Our group then ate lunch and chatted about the best bits so far. We then were accompanied by an actress from the Globe who actually performed on stage. We acted out the play Macbeth, which we had been learning about in literacy, and pretended to be Macbeth, Lady Macbeth and the witches. Next we went on a tour of the Globe and learnt more about what it would have been like when Shakespeare was alive. 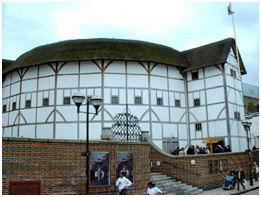 Did you know that there were two Globe Theatres? One was burnt down and the other was pulled down by the owner when the Puritans came into power. The most exciting part came next. We went some stairs and actually got to stand on the stage. We saw the trapdoors that people entered through, both above the stage and below it. Unfortunately the time had passed incredibly quickly and it was time to get back on the coach and say goodbye to London. On the way back, the coach drove us round London and we managed to see some more landmarks. These included: Westminster Abbey, The Houses of Parliament and Cleopatra’s needle. We arrived back at school exhausted and all went home. I’m sure everyone enjoyed it as much as I did and that everyone will remember it for the rest of their lives!